I'm subscribed to so many shop email newsletters that it's hard to keep track but in recent weeks two stores have stood out to me; Miss Selfridge and River Island. So I thought I'd share some of my favourite picks along with trends and styles I'm loving at the moment. Looking back at this little wishlist allows me to discover the trends that I'm into at the moment like how I'm drawn to the most basic of colours but with texture and something else interesting about the item. For instance the cream scallop edge shorts are all over lace with crochet trim and the simple brown biker jacket with quilting and stitching details. Then there are the ribbed materials like the grey roll neck vest and grey ribbed cold shoulder crop and pencil skirt co-ords (yes I love grey). I'm also attracted to co-ords quickly and easily, especially if they're simple but with a little something extra, The cream and beige subtle design of the crop tshirt and pencil skirt co-ords from Miss Selfridge is gorgeous and understated; I need this outfit in my wardrobe. 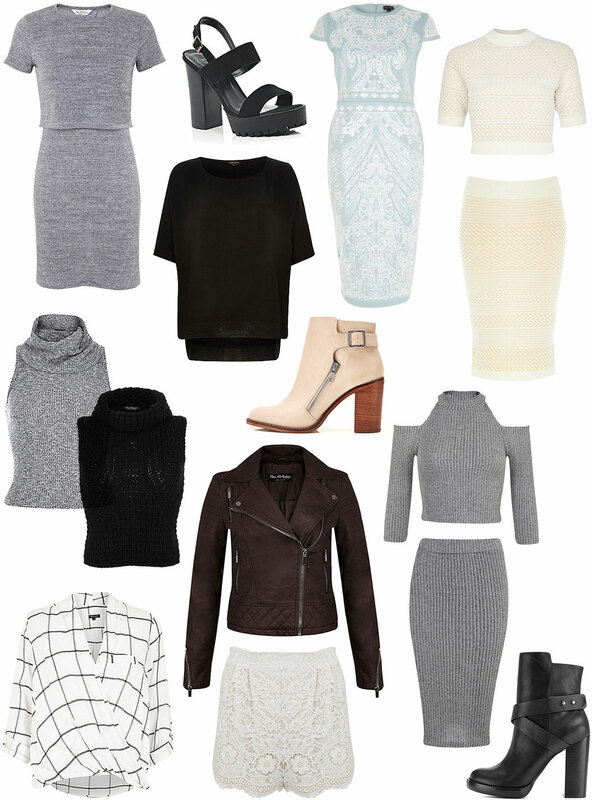 Grey marl, knitwear and boots are a staple of my style so of course they feature here. My favourite shoes from this wishlist are the zip detailed stone leather boots because the wooden heel and light shade leather work so well together, I'm sold.